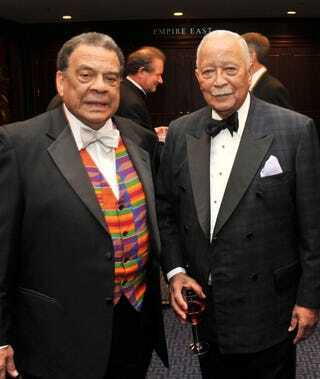 The National Academy of Television Arts and Sciences awarded Andrew Young with the Trustees Lifetime Achievement Emmy on Friday night for being one of the first to integrate television with his Peabody Award-winning series, Look Up and Live. Harry Belafonte, Hank Aaron and Dan Rather were among the many stars who attended the event. Maya Angelou, who narrated the ceremony along with Sidney Poiter, paid tribute to Young and his dedication to equal rights. "Long before he transformed Atlanta, long before he was United Nations ambassador, long before he was elected Georgia's first black congressman since Reconstruction, even before he met Dr. Martin L. King Jr. and set out to redeem the very fabric of this country through a campaign of nonviolent social change, before all that, Andrew Young got his start in television," Angelou said. Black Voices: How does it feel to receive this honor? Andrew Young: "It's flattering, yet it's hard for me to take it too personally, because I think all of the people that have pushed me along and propped me up. BV: How did it feel to integrate television? Read the rest of this interview on AOL Black Voices and learn more about Young's award on BV Black Spin. In other news: In Black New York, Road Show Captures Cultural History in Pictures.